You can get free access (the coupon code is “snowpilates” ) to my short Online Pilates Video Course until Monday 5th March 2018 (normally €39.99) in exchange for some feedback after using the course for a few days. I do this due to the weather conditions today – lots of snow, a bit of ice and the weather predictions for tomorrow/Thursday 1st March 2018 and Friday 2nd March 2018 here in Ireland / South Dublin. This will allow you to keep doing your Pilates, Stretching and Mobilizing exercises, especially as some of you were or are missing the classes that or normally no at this time of the week, due to the snow and ice. No excuses lets get moving, to stay fit and healthy! In the video below you see how to apply the *coupon code* and get *free access* to these videos until Monday 5th March 2018. 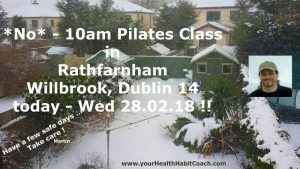 My Fitness and Pilates course website is http://courses.yourhealthhabitcoach.comYou can do these Online Pilates Video Sessions at (1) home or (2) on the go when travelling for work or leisure, in your (3) local gym etc.. You can use your tablet, phone, laptop or desktop to access the course video lessons. I was in contact with Taney Parish Centre, Sandyford Community Centre and Glencullen Community Centre / GAA Start of Erin Hall … all venues are closed on Wednesday evening, Thursday and Friday (28th February, 1st March and 2nd March) according to the centre managers. maybe see you during one of my indoor or outdoor classes. This entry was posted in Fitness Exercise Videos, Pilates Classes, Pilates for Golf / Golfers, Pilates for Men, Special Offers and tagged Free Online Pilates, free until 5th March 2018, March 2018, Mens Pilates Video, Onilne Pilates, Online Pilates, Pilates Videos on February 28, 2018 by admini.